Are you taking a client to lunch with you department? Or, looking to organize a lunch with your school or college friends? Like whatever it may be, you need to plan for business meal! Discover our selection of trendy, traditional, or authentic restaurant that help you make the deal! If you want to impress your colleagues or friends, the Indian Restaurant Ganesha has your group’s perfect dining experience. The Indian Restaurant Ganesha is located in the heart of Amsterdam which is close to the Central Station. Who serve huge variety of dishes in which curry & tandoori dishes are mainly serving in all the groups. And one thing for sure that your group will have a quality experience that they won’t soon forget. Are you looking for the perfect place for your business lunch party in Amsterdam? Make your reservation more than 25 people and get 10% extra discount on your total amount. Normally, it’s working hours are from 17:00 to 23:00 (Daily). 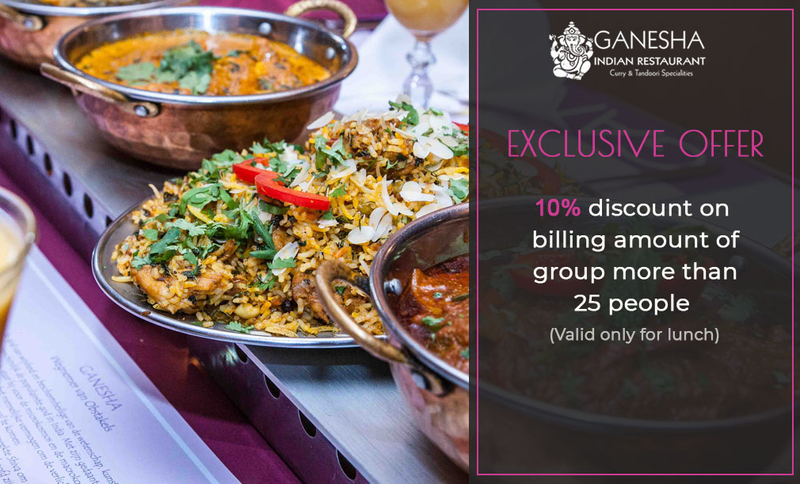 But, Ganesha provides special service to you that if, you have reservation for more than 25 people then, restaurant will be open during lunch time and will give you 10% extra discount on your bill. If you’d like to take advantage of this offer then, make your reservation in big groups. Groups like any business meetings, tourist groups, group of students or any other. Just about everyone who’s planned for lunch, and has faced the frustration & trying to get lunch dining reservations for their trip. Go with this restaurant for fabulous saving and note that this discount will be valid for lunch reservation only for more than 25 people.